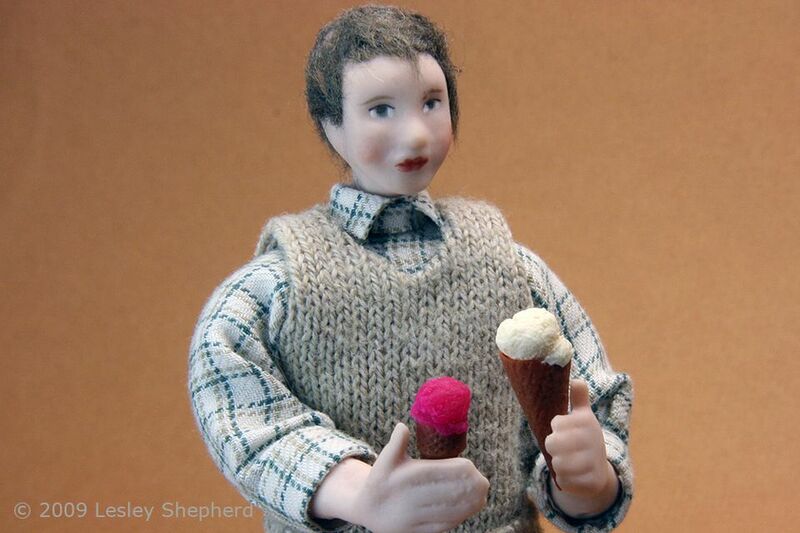 George the dolls house gardener holds a vanilla waffle ice cream cone and a cone cup with strawberry gelato made in 1:12 scale from polymer clay. Photo copyright 2009 Lesley Shepherd, Licensed to About.com Inc.
George, my garden boy, is clutching a gelato and a vanilla ice cream in his rather clumsy hands. Ice creams of all types are fairly simple to make from polymer clay. In the pages that follow I've laid out instructions for flat bottomed cones, as well as traditional waffle cones or sugar cones or cornets. All kinds of ice cream 'flavors' can be made, just pay careful attention to how your particular brand behaves when baked, and blend in translucent clay for particular effects. If you are new to using polymer clay, please read the information on safe handling of polymer clay before you begin. 1/16 of a full block of zinc yellow Premo! clay (1/4 of a 1/4 section) is mixed with tiny amounts of red and blue to make a basic ochre or caramel color for dolls house baked goods. Photo copyright 2009 Lesley Shepherd, Licensed to About.com Inc. Realistic blends for ice creams, sherbets, gelatos and cones are somewhat dependent on the clay brand you use, but can be tweaked to be more realistic in all brands. Basic Ochre Clay for Cones - The photo above shows the blending proportions to make a standard ochre clay used for miniature baking. This color by itself was used for the waffle cones in the instructions that follow. You can add more realism by dusting your cones lightly with an appropriate color of pastel or chalk if you wish. For the lighter forms of commercial ice cream cones, add small amounts of white to your blend until you have a light ochre color. For darker brown sugar cones and cornets, add a bit of deep brown, or a bit more red and blue to your basic ochre mix. Some clays darken noticeably as they bake. If your brand is prone to this, remember that some of these cones are baked twice and try to create a lighter blend of clay to begin with. Sorbets, Sherbets and Gelati - Sorbets have more translucent clay added to the mix than do ice creams. Test your blend and more if necessary. Sorbets are generally fairly pale colors. Sherbet is usually a whiter base than a sorbet and fairly vivid colors. Add a bit of translucent clay and mix it thoroughly into a medium dark color to make a sherbet. Add more white if necessary to tone down the color. Gelati can be very similar sorbets, with only a trace of color, although the ones based on more colorful fruits, mango, raspberry etc., will be very brightly colored. These blends need more translucent clay added to intense colors to create believable mixtures. The raspberry sorbet shown in the photos in these instructions has a high level of translucent clay, notice the difference between the unbaked clay color in the ball forming instruction and the finished sorbet cone. Creating a waffle texture for a flat bottomed dolls house scale ice cream cone using the knurled tightening screw on a hand tool. Photo copyright 2009 Lesley Shepherd, Licensed to About.com Inc. The standby ice cream cone is the flat bottomed stacking cone. These are easiest to make by texturing ochre clay with the knurled handle of any standard tool. The photo shows my mini drill handle. You can texture rolls of clay on a paint brush handle as shown here, but flat bottomed cones are easiest to make using thin strips of textured clay as in shown in the photo on the next page. Note Once you have a perfect baked ice cream cone, you should consider making a mold from two part silicone mold putty. Then you can reproduce as many cones as you want, with a high degree of perfection (provided you worked hard on your master). These molds also work well for reproducing ice cream balls much faster than you can do by hand individually. Shaping a standard flat bottomed dolls house scale ice cream cone over a toothpick or skewer. Photo copyright 2009 Lesley Shepherd, Licensed to About.com Inc.
To make these flat bottomed cones, roll out a thin layer of ocre colored polymer clay. Run the knurled handle of tool over the clay to create the waffle texture (see previous step). Cut the clay into a narrow strip the height you want for your cone. Wrap one section of a strip around a suitable sized piece of dowling, a pen refill, a skewer, rounded toothpick or some other non stick rounded surface so that it overlaps slightly. Gently run the knurled tool over the join to press it together and blend the texture into the rest of the cone. Trim a strip to half it's height and wrap it over the first strip, lining it up with the top of your original roll. See the photo for details. Trim the top and bottom of the cone while it is on the support, then use a polymer clay knife to slide it off the support and onto a baking tile, standing upright. Bake the cone. When the cone is baked, fill in the bottom with a scrap of ochre clay and press it down onto the baking tile to level the bottom of the cone. Add your ice cream to the cone (see steps on making ice cream balls) and bake the cone again standing up. Using needlework canvas to texture dolls house scale waffle cones made from polymer clay. Photo copyright 2009 Lesley Shepherd, Licensed to About.com Inc.
Use a flexible polymer clay blade to lift your wedge onto a piece of needlepoint canvas as shown ( I think this is around 18 count canvas in the photo). Press the clay gently into the canvas then peel the canvas away slightly and use a toothpick to roll the clay into a cornet shape. With the two edges overlapping slightly, press them down together onto the canvas with a rounded toothpick, joining the edges and texturing the clay with the same motion. Peel the waffle cone away from the canvas and set it on polyester quilt batting to bake . The polyester batting prevents the shape from getting a shiny side on the baking tray or tile. A pin is used to roughen the surface of polymer clay to make ice cream balls in dolls house scale. Photo copyright 2009 Lesley Shepherd, Licensed to About.com Inc.
Realistically shaped ice cream balls have holes, crevices and a rough crystal texture. To mimic this will polymer clay it works best if your clay is firm and not too soft. Let the clay sit after mixing until it is firm before you try to texture it. To make an ice cream ball roll out a ball of clay the size you need. Bake your ice cream cones and have them ready for test fitting ice cream balls if you are making ice cream cones. Set your ball on top of a toothpick or modelling tool to hold it while you sculpt it. Take a pin, a wooden toothpick, a folded strip of medium grit sandpaper or a ribbon loop modelling tool, and press it gently into the ball just down from the top. Press up, stretching the very top layer of clay slightly upwards, and breaking it and cracking it in the process. Continue around the ball, then move down a bit and repeat the movement. You should form uneven ripples with uneven bits of clay adhering to the surface. Now take your pin or toothpick and gently press some of the uneven rough edges back down into the clay ball. Where you press down it will resemble slightly melted ice cream. If you want to create an overall crystal texture, gently press medium to fine grit sandpaper over the ball, pulling the clay slightly sideways in some places for more texture. When your ball looks like ice cream, bake it with the bottom of the ball resting on a tile. You can use these balls for ice cream sundaes, for a la mode on pies, or in ice cream cones. If you wish to put them in ice cream cones, see the instructions for creating realistic ice cream cones in the next step. A textured ball of ice cream with an overflowing base for an ice cream cone in dolls house scale. Photo copyright 2009 Lesley Shepherd, Licensed to About.com Inc. When you have worked over the entire ball of clay, press into the bottom edge of the ball and pull the clay down slightly to create the overflow of ice cream you get from an ice cream scoop. Use a fine pin to mark a narrow line around the base of the ice cream ball, as if the ball has been pressed down by an ice cream scoop. Where the pin presses it will form a glossy line, similar to the line created by the ice cream scoop. Use a pin or a toothpick or a polymer clay blade and press up under the ball to remove it from the modelling support. Set the ball on a baking tile and bake at the appropriate temperature for your clay. Ball of chocolate ice cream made from polymer clay, double baked to create a filled effect in a waffle cone. Photo copyright 2009 Lesley Shepherd, Licensed to About.com Inc. This is the step most people don't think of when making scale miniature ice cream cones. To make them realistic you have to fit them into the cone with a realistic overhang, but if you try to do that before the ball is baked, you ruin the texture. If you bake the ball to get great texture, you can't get the overhang when you put your scoop in the cone, what to do? The trick is to bake the ice cream balls and cones separately and then combine them with unbaked clay. Once baked, set a bit of unbaked polymer clay of the ice cream color into your cone. and texture the edges. Now take your baked ball of ice cream and press it down on top of the unbaked clay. Presto! Your unbaked textured clay will ooze over the edge of your hard baked cone, and your baked ice cream ball will nestle down into the unbaked layer. Set your cone back into the oven for a second baking and see how realistic you can make your cones look. The cone in the photo above is not showing its best side, but you can see here how fine a rolled line of scale ice cream you can make using this technique. Just make sure you time your baking so both bits of ice cream will be the same color. Don't overbake! Two waffle cones and a stubby ice cream cone, shown beside a coin for scale. Photo copyright 2009 Lesley Shepherd, Licensed to About.com Inc. Scale miniature ice cream cones can be displayed in simple racks made from folded cardboard, or more durable racks made by gently heating and bending sheet styrene or 'friendly plastic'. You can shape fallen balls and cones by baking them flat on a tile as if they had fallen on the floor, or create slightly raised balls on almost flat sheets of polymer clay, to resemble melted balls of ice cream on a flat surface. To set them into the hand of a doll temporarily use museum wax, which will hold them fairly securely as they are usually lightweight. Consider making more traditional shapes of ice cream as well. Decorative bombes and other shapes can be made from dolls house copper molds. You can make upside down ice cream cone clowns for a child's party, or use ice cream balls for all kinds of desserts and sundaes.